The choice of the right wedding hairstyle is as responsible as the choice of a wedding dress. If you can’t decide between an updo and downdo type, we suggest you pay attention to the variety of different half up half down bridal hairstyles. This way you’ll enjoy the best qualities of the both hairstyle groups – the naturalness and chic of freely flowing locks and the elegance of the lifted up part. Here are the best half up half down hairstyles you can style in 2019. Our review includes the latest natural hairstyles as well as incredibly feminine ‘dos with braids and bridal veils. This cute style is half French twist, half cascades – it’s lovely on medium hair. A more formal look is achieved with the addition of a bump, which is perfect for a bride who wants something simple that makes a statement. This fun hairdo is completed with soft curls, adding dimension to the hair. First of all, this is a showstopper. Second, who wouldn’t want this lovely hair? Flecks of balayage are accented with curls for long hair down the back. The locks are poufed and side twisted to add a plethora of visual interest that will captivate your guests. This style just says FABULOUS! Here is one of those wedding hairstyles down that stands out with its creativity. Side pieces are pulled back while they are twisted and woven together to create such a stunningly gorgeous braided detail. Interesting color solutions like ombre and balayage also show up really well in exquisite hairdos like this one. If you choose a halfdo with a bump, the base of the bump is the perfect place to add a veil, and this bride did it just right. The addition of soft, long bangs and long waves keeps this style simple and sweet to show off your beautiful face. This also allows for easy veil removal, so that you can move and have fun at your reception. As far as styles go, this one shows that a lady has panache and style to boot. The twists are swept to the side to create an innocent-looking off-center style that complements a variety of face shapes. This is the perfect look for those ladies who wish to incorporate extensions and wear a long-lasting style. Take a gander at the beautiful curls we have here! The stunning ombre dye job flows from dark at the roots to white blonde tips. A jeweled clip peeks through the mass of angelic curls. If you plan to wear a bridal gown with a low cut back, this is an alternative to an updo. You might be an experimental fashionista when it comes to your everyday style, but you will probably want to keep things traditional for your wedding. There is still room to play around with wedding hairstyles for long hair. A ‘do with veil is classic. Add pizzazz to your covered bridal hairstyle with a shimmering tiara that matches the pattern of the lace. Imagine a bohemian bride wearing this romantic ‘do as she walks down the aisle in an ethereal gown… It is made for an outdoor wedding. We love the tender headband with ribbons and the tiny flowers stuck in the curls. It is tempting to go all out preparing for your wedding because it is your “big day,” but showing some restraint actually creates head-turning results. She shows how it’s done with the loose wavy hairstyle that features some softly clipped back layers. Oh la la. Any bride-to-be knows that her gown is going to be the focal point of her entire look, but that doesn’t mean her mane has to be understated. Wedding half updos with shimmering hair accessories complete fancy dresses without competition. We love the asymmetry of this gorgeous half updo. When it comes to your big day, you probably want something that will have people swooning! That’s where crystal-embellished hair accessories come in. They’re practical because they get your tresses off your beautiful face, and they add even more bling to your fancy outfit. Who says that you have to save flowers for your bouquet? Take your favorite floral crown from music festivals to your wedding day by pairing it with undone waves. Soft eye makeup and rosy lipstick will complete your blushing bride look. 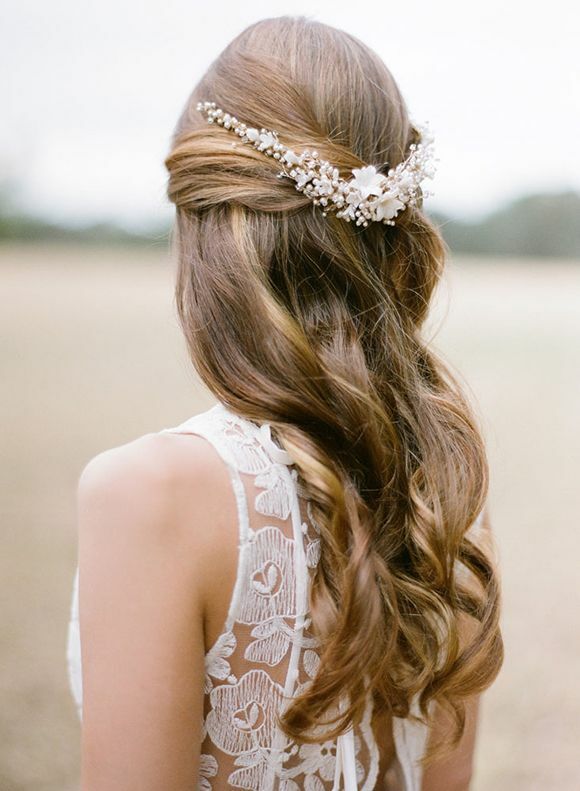 This bridal hair oozes romance, and that is exactly the sort of thing you want when you’re walking down the aisle. Half up wedding hair with mega body and luscious curls is made for long hair. Those with shorter locks can still achieve the ‘do with the help of extensions. There’s more than one way to wear your wedding veil. Sporting it over your head is something we see on many brides, but having it tucked under the upper part of your updo lends an effortless finish to your bridal look. Pin it under a soft braid and finish things off with a tiara or a jeweled hair clip. Jeweled hair accessories can make even the simplest ‘dos feel a little more special. It’s hard to say whether her swept back curls could look any pettier. But with the delicate hair piece they have instantly got Bridal. Half up wedding hairstyles are the best because they look like an updo at the front and show off the length of your gorgeous hair at the back. If you prefer sleek yet voluminous wedding hair styles, draw inspiration from this breathtaking look. It’s a style a bride or a bridesmaid with long hair would be pleased with. This hairstyles looks very spontaneous and quick-to-do, and we love that! Ideal for an outdoor ceremony, the half updo would complement a boho dress or any other informal bridal outfit. A crown braid becomes more exciting when it’s decorated with an elegant hair band. A bouffant won’t hurt either. It’s something that instantly makes your hairstyle more meaningful. Half up half down wedding hair is the best of both worlds – hair is away from the face and flowing in soft curls. A curly half up like this one benefits from a dynamic clip that you can coordinate with a necklace or shoulder-grazing earrings. 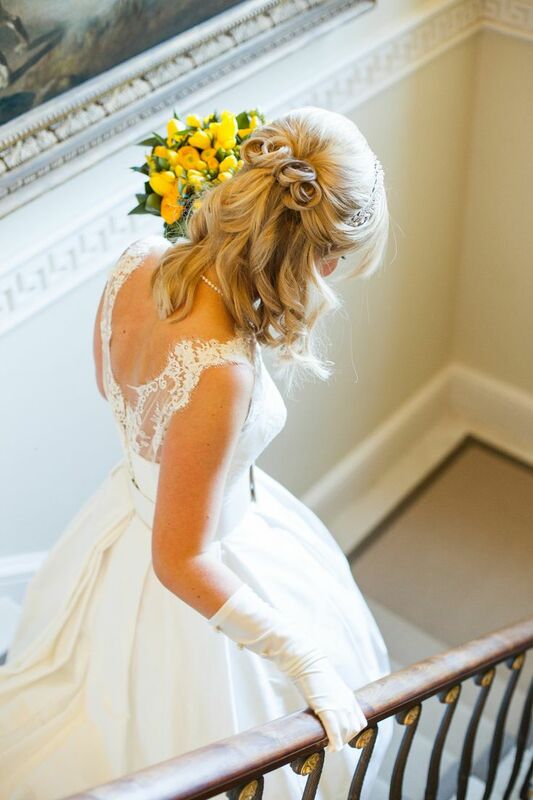 Every bride wants her ‘do to highlight her face but it is also wise to think about the back of your head. After all, a lot of your guests are going to contemplate you from behind. The whimsical baby’s-breath band plays up the print of the gown and tenderness of those undone blonde waves. The hallo braid mirrors the cut of the dress, the bouffant gives height, and the bangs are optional but here they do look charming. When choosing the best bridal hairstyle, coordinate it with your dress, then it will really be the most flattering for you! Wedding hair down ideas for medium length hair often suggest curls. Trendy curls are tousled, not those perfect hair-to-hair ribbons. The simple romantic style topped with a snowflake-like clip is divine for weddings! It’s your special day, so, if you want a long veil and a sparkly tiara, go for it. Just make sure you don’t cover your mane completely. When you have glossy waves cascading down your shoulders you want them to be seen. Same goes for your stunning jewelry. The choice of hair color is another important consideration on your long wedding to-do list. If you don’t plan to wear a veil or any hair pieces, make color your main adornment. Choose wisely, shy away from everything extraordinary, and you’ll love it when you look through your wedding photos years after. Some brides prefer to wear their hair down, while others are in love with half up half down wedding hairstyles. Those falling into the second camp will surely be inspired by this dazzling twisted updo. It’s a lovely option that may compliment the twisted design of the lace covering your shoulders. Half up half down wedding hairstyles like this one are perfect for a Boho bride. A sweet braid wrapped like a headband offers a feminine touch along with lovely waves flowing freely over the shoulders. It would complement a lace gown perfectly. This bride is as darling as can be with a deep part and hair swept to the side. Those who want a style with a veil can definitely pull off this stunning, face-framing downdo with ease. Soft curls also add movement and texture to this wedding look. If you want to go curly, then this look is for you! Not only is hair very loosely braided, but the “down” part of this hairdo is off center for a more relaxed trendy look. Waves and curls abound and will give you a lot of volume on your big day. This style is simple, free-flowing and so stunning… hair is pulled off of the face to let your lovely features take center stage. 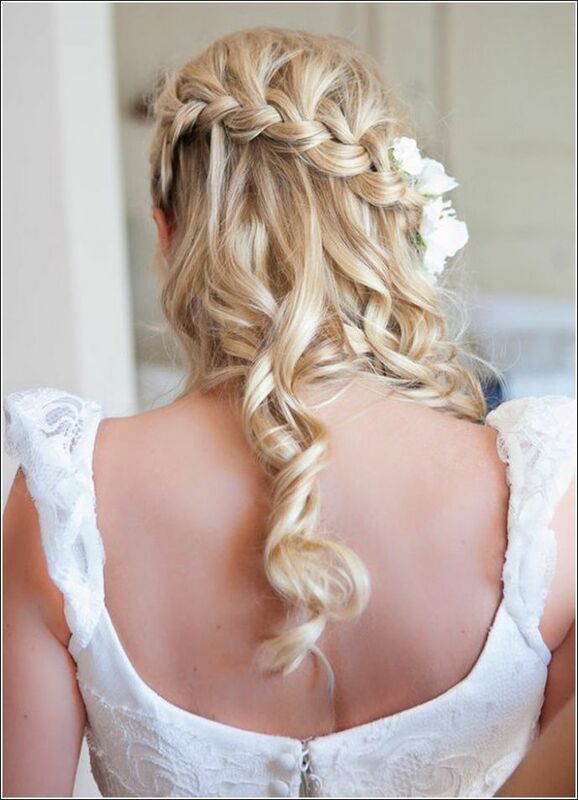 Curls are combined with a braid, and a barrette is tucked to the side, giving an extra oomph to this bridal look. Talk about high impact! Some half up half down wedding hairstyles just say “perfection”, and this one does exactly that. Whether for bridesmaids or the bride herself, this bumped up half updo is topped off with length at the sides that complements those striking features beautifully! Got ombre tones or highlights? Show them off with a braided, curly half updo like this one here. Hair is completely off of the face, yet flows perfectly in a sea of curls topped off by a lovely braid. This style is both interesting and stunning, especially when paired with a fun color solution. Twists and waves make this classic style a go for the brides-to-be who want to wear their long hair down. Reminiscent of a Grecian goddess, elements such as pins and rhinestones can be incorporated to add even more interest to this already gorgeous style. 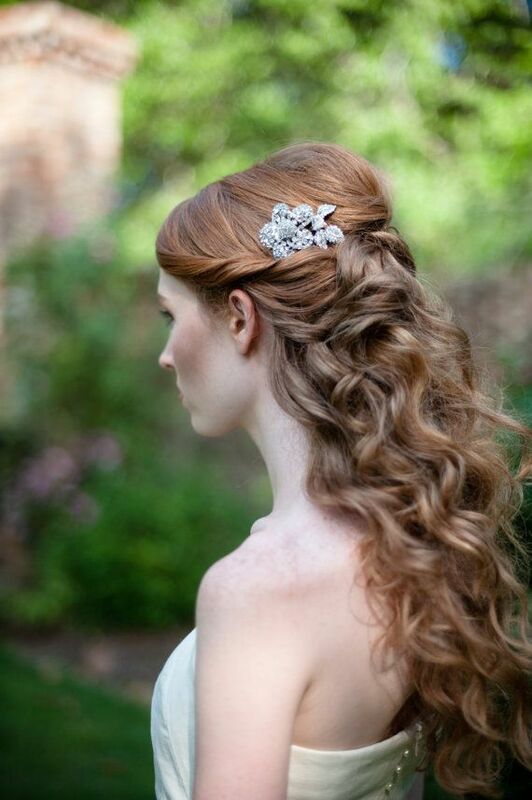 What an intricately gorgeous hairstyle for weddings! The braids start at the crown, end at the back of the head and fall into a delicate cascade of curls and waves. This style is stunning both coming and going and ranks among the most detailed half up wedding hairstyles on our list. Beautiful! What a lovely yet effortless look! Short locks are pulled back with a pouf at the top of the head to add height. The style is secured with a few bobby pins and really shows off the variation of hues in her hair. Having been ranked as one of the more formal hairstyles, this look is mesmerizing. It features an almost full updo with one section of hair simulating a low ponytail upgraded with a sophisticated color solution – reverse ombre. This style is perfect for a woman who chooses the look of an updo from the front, yet wants to have the security of hair down the back. Classic half up half down wedding hairstyles like this one offer a sophisticated, feminine flair. Hair is pulled back and allowed to flow. Selected strands are then twisted into circular rosettes. You could even add a tiara to this style to enhance the interest both in the front and back. This just has to be one of the sweetest looks ever. Two braids – one thick, one thin – are placed across the crown of the head, while the front pieces are tucked back (lovely!) and secured in the back with a small spray of flowers. The back of the hair is allowed to flow freely down the back. How sweet and delicate – this one is a sure fire favorite! Having your locks straightened and braided is a great idea for those who like to see their wedding hairstyles down. Adding a few waves give the look some beautiful texture for long hair down the back. What a pretty bride you are going to be! Lacy braids and a bow of hair… all topped off the look of the low curly ponytail. This style has a lot going on, but each detail works flawlessly together. The half updo will suit a girl who wants a wedding Boho look or enjoys hairdos with variety and interest. This is one of those highly requested wedding hairstyles down for a straight haired woman who wants to be all curls on her wedding day. Hair is curled and pulled back halfway, which makes for the perfect location to add an interesting wedding comb or tiara. So pretty! A half up half down hairstyle for long thick hair should be simple but impressive. This is exactly the case. The lush, touchable curls, fancy tiara, the play of symmetry and asymmetry – we are impressed and enchanted! The showiest way to present the long curls is to gather them on the crown and let them gracefully cascade down. This is a gorgeous hairstyle from any angle of view: the lift at the roots makes any face more attractive, thanks to the sleek sides your profile is becoming more refined, and the flows of curls at the back literally mesmerize! If you do not want any pomposity in your bridal look, you will perfectly do without any bouffant, intricate braiding or new, exquisite curl patterns. The maximally natural hairstyle in this picture will please Boho brides. The easily pinned front locks and effortless loose curls are irresistibly charming, and the V-shaped hair piece is, unquestionably, the most suitable accessory for this cute look. A typical solution for half up hairstyles is to pin the front locks at the back with a cute hairpiece as an adornment. And shaping a few knots from hair as a substitute for a hair clasp is a more creative idea. You can still use a jeweled headband and eye-catching earrings. Shapely polished curls look great in both medium and long lengths. If you want to make an accent on the flawless shape of your curls, their polished finish and fantastic shine, make a simple half up half down hairstyle. It will look good with minimalistic accessories that do not distract attention from the beauty of your locks. If you are a fan of the popular today bronding hair color solutions, your wedding hair will look amazing in dimensional waves. The fabulous texture of the rigid waves is the “wow” factor of this gorgeous hairstyle. But the dyeing procedure should be certainly planned beforehand. According to the current trends in wedding fashion, the tenderness and naturalness of the look are the key factors to pursue for modern brides. This lovely long hairstyle meets all the contemporary fashion requirements. The curls look soft and natural. They literally breathe with ease and spring freshness! Braided hairstyles are associated with girly charm and innocence. That’s why braids have always been very welcome in wedding hairstyles. The diagonal waterfall braid and bouncy curls are a cute win-win combination. 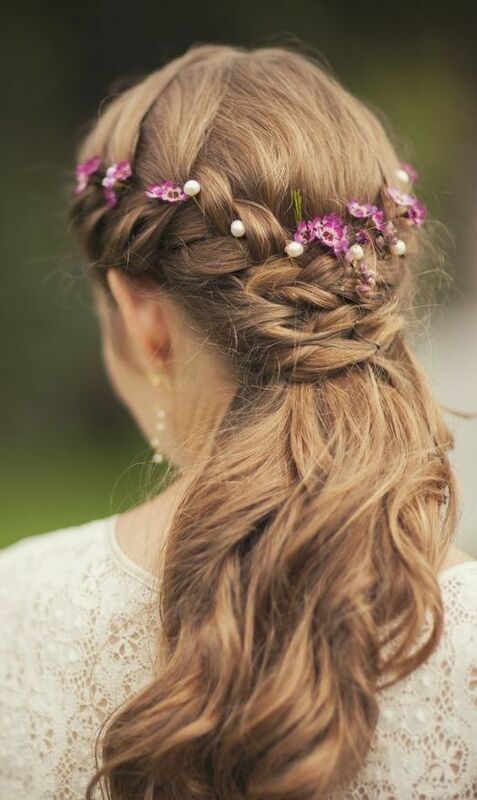 You may add a few big hair flowers on one side or adorn the braid with a sprinkling of tiny buds. This hairstyle reminds a low pony in its silhouette, but it looks more sophisticated thanks to the headband braid and intersecting locks at the nape. Besides, we can’t help admiring its gorgeous messy feel of lively locks, free of any styling products. The cute field flowers are the sweetest compliment, indeed. If you want to wear a fluffy bridal veil on your wedding day, half up half down hairstyle is the most appropriate base for it, especially if your hair is long. You can show off beautiful curls and wear your voluminous wedding veil with ease and comfort. Half up half down bridal ‘dos are beautiful and comfortable to wear. They are easy to pair with a bridal veil, flowers and jeweled hair pieces of any design. There are half up hairstyles to fit any wedding theme and suit any hair length except for very short hair. So, why not to choose the image you like and test it with your hairstylist?